The event was a full house, with over 10 speakers providing their thoughts on Lord Bilimoria’s milestone and the broader contribution of British Indians to UK Parliament. Lord Bourne, the Parliamentary Under Secretary of State for the Department of Communities and Local Government was the opening lead speaker, highlighting the contribution of the Zoroastrian Community and so too the broader British Indian community. With Dadabhai Naoroji being the first MP of Indian descent to be elected in 1892, as a Zoroastrian Parsi, the Reception was naturally being held under the jurisdiction of the Zoroastrian All-Party Parliamentary Group. 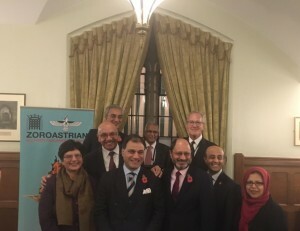 Lord Bourne rightly pointed out that not too many people were aware, that the first three MPs of Indian descent to sit in the House of Commons were Zoroastrian Parsi. ‘It has put your faith on the map, and tells people more of its history, its beliefs and its onward journey, the Minister stated. Having witnessed Lord Bilimoria’s achievements in Parliament and beyond, Lord Dholakia and Baroness Prashar, who have been mentors to Karan were proud of his achievements and progress across the years. Baroness Prashar stated how honoured she felt in being considered a mentor to Lord Bilimora, with his significant contribution to entrepreneurship, business, UK-India ties and being a crucial voice for international students in British Politics. Lord Dholakia also praised Lord Bilimoria as being a beacon of how well the Zoroastrian community had integrated in every country and community whether it be in Gujarat, India or in the UK today. His Excellency, the acting Deputy High Commissioner, Shri Dinesh, K. Patnaik touched on the profound ability of the Zoroastrian community to integrate, but at the same being wonderfully able to hold on to its roots too. Mr Patnaik recollected having a meal at a Zoroastrian wedding, where the food was presented on a leaf, but also with a fork and knife, which the Deputy High Commissioner believes, was emblematic of how the Zoroastrian community had maintained its culture, but simultaneously embracing modernity every step of the way. The Deputy Leader of the Liberal Democrat Party also mentioned the role the Zoroastrian community had played in preserving Indian culture, whether it be in the arts or literature. As a member of the Commission for Racial Equality that was established in the 1970s, Lord Dholakia, also pointed out the political breakthrough the British Indian community and the broader British Minority and Ethnic (BME) community had made into British politics in recent times. As opposed to the Indian diaspora in East Africa and Fiji that were largely reluctant to enter the political frame, in the House of Lords Lord Dholakia also named Bernie Grant, Keith Vaz, Dianne Abott and Paul Boateng as being the political pioneers of the more diverse Parliament we see before us today. The former President of the Liberal Democrats also stressed the need to see British Indian Parliamentarians as politicians that happen to be of Indian descent and look at their wider contribution to British society. Conservative Peer, Lord Popat also shared the platform to give his thoughts on Karan’s 10 year anniversary. Lord Popat likened the House of Lords to the world’s best university and how Karan had been an embodiment of learning and absorbing at the institution which is the ‘mother of all Parliaments.’ Lord Popat also cited, Lord Bilimoria’s maiden speech in Parliament 10 years ago this month, where Lord Bilimoria highlighted the untapped potential of the UK-India relationship. Lord Popat poignantly pointed out how Lord Bilimoria’s ambitions in this regard were being realised, with Prime Minister Theresa May, making India her first trade visit destination, which would be pointed out by the recently appointed Peer Lord Gadhia. As contemporaries at the University of Cambridge, Lord Gadhia fondly remembered how he had always seen something special in Karan since his University days and how his presence and contribution is strongly felt, whether it be from business, entrepreneurship or in his capacity as Chancellor at the University of Birmingham. Shailesh Vara MP also fondly remembered earlier memories when they had discussed their future career paths and anticipated how Karan would be appointed to the House of Lords and he himself would become a member of the elected chamber. Virendra Sharma MP for Ealing Southall, stressed how Lord Bilimoria had always provided a powerful presence and voice when the situation demanded it on key issues, whether it be international students or skill shortages. ‘This is what I admire most’ about Karan, stated the Chair of the Indo-British APPG. The Labour MP underlined how, despite all the success Karan has enjoyed over the years, he has always been a decent and honest human being and has not limited himself to any single compartment, but to the contrary as Lord Popat pointed out earlier, Karan has been a champion for breaking the glass ceiling. Dorab Mistry, who is the Executive at Godrej Industries Ltd, recounted how a friend, Dr Natubhai Shah, had stated that whilst you may have only one Parsi in Parliament, he is equivalent to a dozen, which Mr Mistry felt encapsulated Karan’s influential contribution. Finally, Mr Mistry fittingly remarked that Karan had always been proud of his Zoroastrian roots, and the Zoroastrian community were just as equally proud of Karan and his achievements. It appears appropriate to end with Lord Gadhia’s complimentary remark that that just like wine, Karan would get better with age. ← Faith-based Ethics in Business – The Cadbury and the Tata way.